As if the Devils Lake walleye populations wasn’t rated one of the best in the Midwest, this summer’s fisheries netting surveys proved, “All size groups had a bump in catch rates,” according to area biologist Todd Caspers. 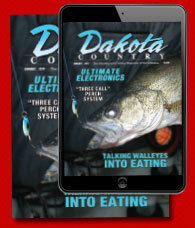 The total number of walleyes caught per net this year was 24, compared to 18 last season, a 33 percent increase. “The above average catch of big fish indicates these year-classes are doing pretty good,” he said. Also, the up-and-coming class of 15 to 20 inchers is above average, with eight per net compared to six on average over many years of research. The fisheries crews spread 39 nets at 15 designated locations. To supplement what might be lower than normal walleye hatches the past two years, Caspers and crew stocked 1.7 million walleye fingerlings recently. Guide and world walleye champion Johnnie Candle (johnnie@gondtc.com) said, “Walleyes utilize nearly all the habitat types. What’s ideal for anglers is they can come here and fish what they’re good at and catch fish – shallow to deep.” Better yet, Candle likes the fact that many anglers show up wanting to learn new tactics, which they do with confidence, knowing fish will be waiting. “I have many customers who want to learn new techniques. Teaching them is fun and rewarding,” he said. A typical day starts with casting cranks shallow; progressing to bobber fishing humps; followed by bottom bouncers and spinners; with perhaps jigging glide lures on deep rocks in the afternoon. Mark Bry (brysguideservice@gmail.com) said, “It’s not uncommon to catch 50 to 100 walleyes a day, even during the dog days of summer.” He continued, “Whatever method an angler prefers will work here. 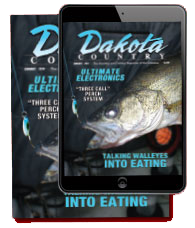 This is not just guide-hype, but something my customers quickly learn for themselves.” His clients express amazement about how healthy the walleyes are. “In my opinion Devils Lake is the top walleye lake in the United States due to the freshwater shrimp available. Shrimp feed the entire ecosystem. The fish are fat and with a possession limit of 10, everybody goes home to share the walleye wealth of this great body of water,” Bry said. TV host and guide service owner Jason Mitchell (fishdevilslake@hotmail.com) tells potential clients that a day with any of his guides is more than a limit of fish. “Our goal is to teach as much as possible about the many nuances of Devils Lake. Customers love the educational aspect of each guide trip,” he said. Whether matching presentations to the client’s favorite methods or mixing it up with new and different tactics, most days are “multiple-pattern days.” What this means is that guides and anglers spread out throughout the nearly 200,000 acre North Dakota lake and are able to find fish. Interesting statistics from creel surveys, according to Caspers, is that 78 percent of summer anglers (May to October) prefer to chase walleyes. In winter, 18 percent primarily seek walleyes, 28 percent said “perch,” while 27 percent said “walleyes and perch.” A quarter of survey respondents said, “Anything.” Adding all the answers together that mention walleyes, 70 percent of anglers would just as soon catch walleyes in winter as well. The website devilslakend.com features up-to-date fishing reports with emphasis on the current late summer and fall fishing activity. Also, the site contains a new pike de-boning video, plus contact info for fishing guides, hotels/resorts, lodging and restaurants. In addition, learn about ramps, fish-cleaning stations and community events. A helpful map serves as a great reference tool. For personal assistance, call 701-662-4903, and talk to a friendly and knowledgeable North Dakotan who was probably on Devils Lake yesterday.